Kelp is a rooted plant which only grows in water or water-like blocks on top of a sand-like block which does not fall. The kelp plant has a random height that spans multiple blocks. It occours naturally in temperate and cool oceans on top of ordinary sand in shallow water in temperate and cool climates. This block is not generated in the v6 map generator. To mine a kelp, you can either point at the plant itself or the sand-like block at the bottom and mine it with a sword (for faster mining) or just your hand. 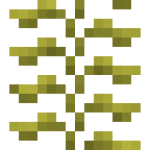 To place a kelp, you have to put it on the bottom of a column of water-like blocks (e.g. in a lake or ocean) at a depth of at least 4 blocks. Placement may fail at low depths because the kelp might attempt to “grow” higher and fail. In that case, just try again until the placement succeeds. Although the base block looks like sand, it is an entirely different block. Unike real sand, it does not fall and shares the mining properties with the kelp. In fact, the kelp and the “fake sand” block are one unit. This page was last modified on 6 March 2019, at 18:10.